We are happy to announce the addition of The Arcane Wilderness to the Reservoir Geeks Tape Deck. It's the first foray into the fictionalized podcast and we could not be happier. Hosted by Samuel Martinez and Josh Brimhall, the series follows Dr. Gregory Malius into the wilderness as he interviews the most famous beings cryptozoology has to offer. Here's a sample clip from episode one. Enjoy. Posted on March 18, 2018 by Reservoir Geeks and filed under Reservoir Geeks News and tagged podcasting. We're are quickly approaching our ninth year here at Reservoir Geeks and it reminds us of our humble roots at two guys who'd podcast. Andy had just ended his two year marriage, Chris had just moved to a cabin in Burleson, Texas and both had way too much extra time on their hands. Podcast was a new platform and, possibly delusional, the boys thought they should start their very own podcast. 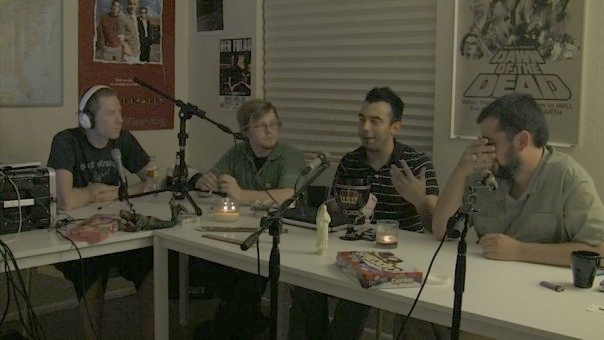 For a point of reference, the first Nerdist podcast was in February 2010. Explaining what exactly a podcast was that early was one of the first hurdles and the inability/lack of knowledge to put podcasts on iTunes was another HUGE hurdle. Despite that Reservoir Geeks persevered and kept moving forward. Eventually the podcast took on Benny Beck as a producer and an additional mic in current Reservoir Geek Josh Mazur. Things went well for a while but as all things do, life got in the way. Chris left the rural life and moved to swanky Dallas and Andy changed careers and starting dating his ex-wife... We'll save that's for another time. Starting back in 2016 the boys got back in the podcasting game and started the Tape Deck Network. After a few pleasant bumps in the road in 2017 and with the revamping of this very site at the beginning of this year we are moving hard at posting more episodes, adding a couple of new series and consistently providing new episodes for you fine folks. All that being said, tomorrow (February 26th) a new episode of Prequel. Sequel. Reboot. Remake. will be up with our pitch for a real remake of the 1974 classic Death Wish! Posted on February 25, 2018 by Reservoir Geeks and filed under Reservoir Geeks News and tagged podcasting news. If you're reading this, you've already found our new blog page. Congratulations! With our yearly Lovely Soiree at the Bottle Rocket Motel moving to a five year event we now have a lot more time on our hands. It has been our desire to take this site from a simple informational website to a source for news and entertainment. With that said we have added on a few new geeks to help make it even better. You can click on over to the Geeks page to take a look see at them purdy faces. If you've been to a Lovely Soiree you will be familiar with them and know they're good folk. If you haven't been to a Lovely Soiree, then take our word for it. In addition to new geeks we're going to be posting regularly here with news, stories, art, whatever tickles our fancy and hopefully yours. THAT'S NOT ALL! We have a lot of new ideas for videos that you'll be able to find on YouTube (a site with tons of videos... you should check it out). Now, if you listen to our podcasts on the Tape Deck you've probably noticed that we were a bit inconsistent in posting new episodes in 2017. What can we say, we had some life changes that kept us busy but now that the dust has settled and life has adapted we are going to be back at it starting in February. New shows, more often and perhaps a live episode or two or more. We are very excited about this new chapter and look forward to having y'all there with us! Here's to 2018! ! ! Posted on January 1, 2018 by Reservoir Geeks and filed under Reservoir Geeks News and tagged News.